Serum concentrations of arctiin, tracheloside, and their metabolites formed in the gastrointestinal tract were investigated in the rat. Arctiin or tracheloside was not detected in the serum after oral administration (200 mg/kg). 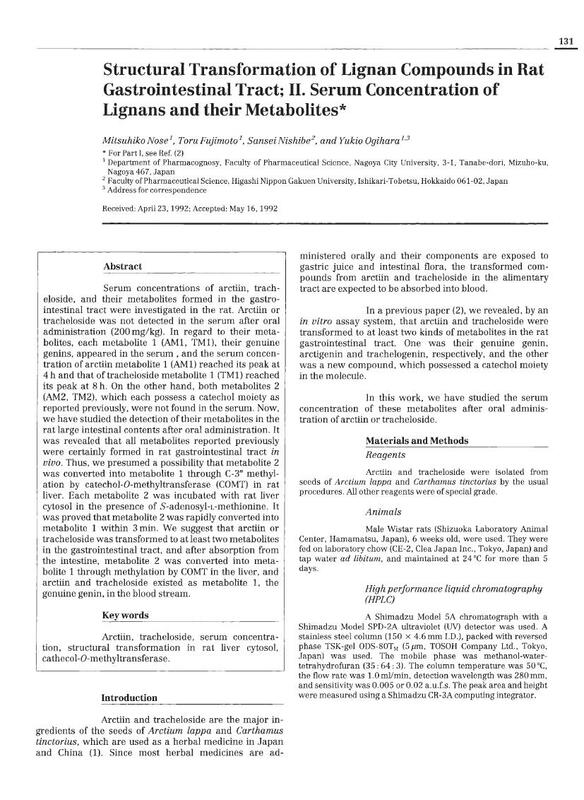 In regard to their metabolites, each metabolite 1 (AM1, TM1), their genuine genins, appeared in the serum, and the serum concentration of arctiin metabolite 1 (AM1) reached its peak at 4h and that of tracheloside metabolite 1 (TM1) reached its peak at 8 h. On the other hand, both metabolites 2 (AM2, TM2), which each possess a catechol moiety as reported previously, were not found in the serum. Now, we have studied the detection of their metabolites in the rat large intestinal contents after oral administration. It was revealed that all metabolites reported previously were certainly formed in rat gastrointestinal tract in vivo. Thus, we presumed a possibility that metabolite 2 was converted into metabolite 1 through C-3″ methylation by catechol-O-methyltransferase (COMT) in rat liver. Each metabolite 2 was incubated with rat liver cytosol in the presence of S-adenosyl-L-methionine. It was proved that metabolite 2 was rapidly converted into metabolite 1 within 3 min. We suggest that arctiin or tracheloside was transformed to at least two metabolites in the gastrointestinal tract, and after absorption from the intestine, metabolite 2 was converted into metabolite 1 through methylation by COMT in the liver, and arctiin and tracheloside existed as metabolite 1, the genuine genin, in the blood stream.